It's so hard to say goodbye...to my giant roll of Pillsbury peanut butter cookie dough. But this day had to come because even processed dough has a shelf life. I was very pleased with how my PB S'mores Cookies turned out, and the classic Peanut Butter Blossoms failed to disappoint. And Jimmies, because, why not? 2. 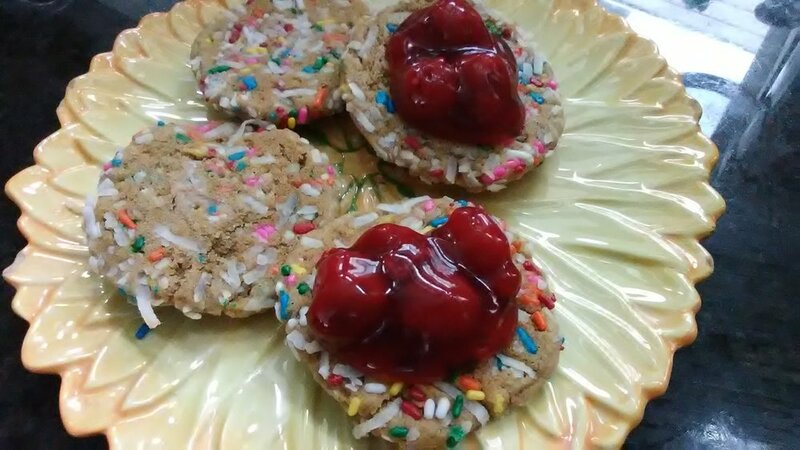 Using a spatula, combine dough with sprinkles and shredded coconut. 3. Shape dough into an even number of balls. 4. On ungreased cookie sheets lined with parchment paper, place balls 2 inches apart. 5. Bake 9-13 minutes until golden brown. COOL COMPLETELY. *If you can't handle this instruction, you probably should not be allowed to use an oven. I found the coconut added a certain cream flavor that complemented the slightly tart cherries and balanced the strong peanut taste, akin to how that cool glass of milk pleasantly tempers a a thick peanut butter sandwich. In my Marvel movie, I am the Queen of the Universe and only my opinion matters. Barring the release of that film, I want to hear what you think. Honesty is welcome. Alternative facts are not.